Total Built-Up Area - 2525 Sq.ft. 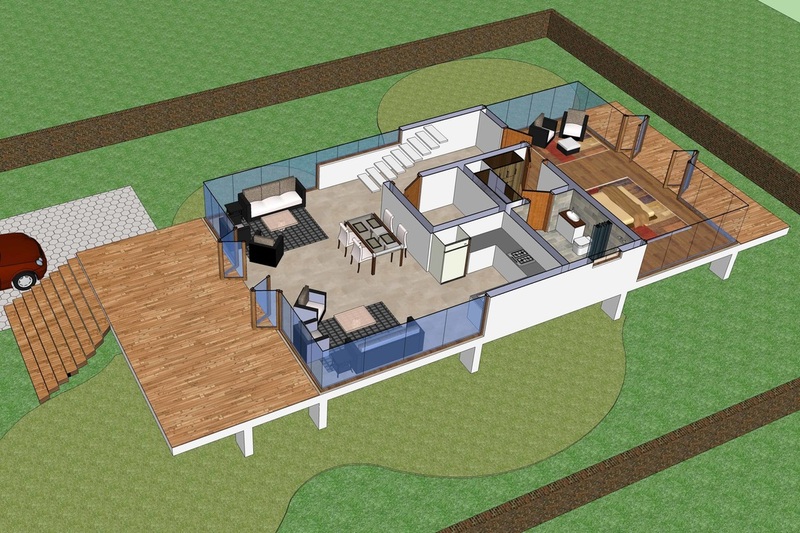 This simple rectangular plan of 1265 sq.ft. one floor house is unique in its approach and feel. The idea of having a floating floor slab imparts a feeling of lightness to the overall structure. The front glass imparts complete visibility from the living room which also accommodates an open kitchen along with the dining space. Although the plan in quite compact still it makes provision for a store room which is accessible from the passage space which leads one to the main bedroom area. The large size of the master bedroom makes it just right for a relaxation as well as creates a corner niche for seating / reading. This room also includes an attached bathroom which is next to a walk-in-wardrobe space. Sincere thoughts have been given for accommodating space for studying in the bedroom along with reading. The massive glass opening just makes it perfect to have a great view of the environment and the nature around the house. This floor plan will suit the temperament best required for luxury resort cottages / units or for weekend house plot owners. This is not very much of a city house, but with changing times and growing awareness & requirement of luxury living spaces this floor plan can be considered for narrow plots for urban living.